This entry was posted in Earth Sciences and tagged Iran, Pakistan, quake. Bookmark the permalink. 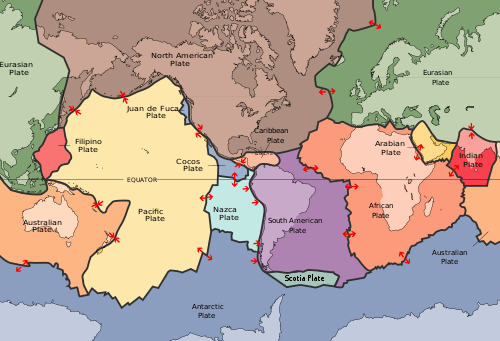 Those interested in volcanoes and earthquakes might enjoy This Dynamic Planet, a map produced by the USGS, the Smithsonian and the US Naval Research Laboratory. It is 43 inches by 58 inches (approx..) available for US$14 — cheap. Better yet, a high resolution PDF can be downloaded. I printed (OK, Office Max printed) a 24 x 36 (approx.) version, mounted it on foam core and have it hanging right here. Modern global earthquake fatalities can be separated into two components: (1) fatalities from an approximately constant annual background rate that is independent of world population growth and (2) fatalities caused by earthquakes with large human death tolls, the frequency of which is dependent on world population. Earthquakes with death tolls greater than 100,000 (and 50,000) have increased with world population and obey a nonstationary Poisson distribution with rate proportional to population. We predict that the number of earthquakes with death tolls greater than 100,000 (50,000) will increase in the 21st century to 8.7±3.3 (20.5±4.3) from 4 (7) observed in the 20th century if world population reaches 10.1 billion in 2100. Combining fatalities caused by the background rate with fatalities caused by catastrophic earthquakes (>100,000 fatalities) indicates global fatalities in the 21st century will be 2.57±0.64 million if the average post-1900 death toll for catastrophic earthquakes (193,000) is assumed. … Of course, no seismologist wants to see people suffer because of earthquakes and many use their scientific and technical skills to help reduce the seismic risk. This job however is becoming more and more difficult, because the world population is growing rapidly and many megacities are located in seismically active zones or at coastlines prone to be hit by tsunamis.